Did you ever want to have a picture slideshow on your desktop which reflects your mood? Ever had a directory full of pictures which you don't know what to do with, but maybe would look good as wallpaper on your desktop? Then DeskDeco is just the program for you. DeskDeco was designed to let you choose one such directory full of pictures and it will then shuffle through the list of pictures and select one to put on your desktop. By default, the desktop will be replaced every time that Windows is started, but DeskDeco can be configured to keep changing the desktop at a customizable period of time. Option to resize pictures, apart from your usual centre, tile or stretch wallpaper options (now with multiple monitor support). Automatic(Random) or manual selection of desktop pictures. Choice to change the desktop wallpaper once a session or every preset amount of minutes. 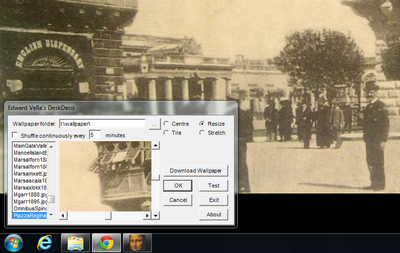 Preview of the desktop picture within the program. Links to DeskDeco blog, where new wallpapers are periodically made available. Now works with the .Net framework and Windows Vista/7. DeskDeco requires the installation of the Microsoft .Net framework version 4 and will not work without it. Please visit this link if you need more information on how to install it prior to using DeskDeco. Installation of DeskDeco itself is pretty straightforward. As with much of the other software, you double-click on the Setup icon and keep clicking the Next button until you encounter the Finish button, which you would then press. One thing to note is that by default a shortcut will be created in the Startup menu, which actually makes DeskDeco run every time that Windows is started. Once DeskDeco is launched, the desktop wallpaper is changed and the DeskDeco icon appears on the System Tray (somewhere near the clock on the Taskbar). That's it, it will stay there until you need to configure some settings or Windows is restarted, where the process will be repeated once again.